_ Benjamin Mitchell Gibson, a native of Illinois, was born March 30, 1841 in Clinton County, Illinois. Before the outbreak of the American Civil War, Benjamin M. Gibson was a farmer at his homestead in Centralia, Marion County, Illinois. According to the Illinois Civil War Detail Report, Benjamin Mitchell Gibson enlisted to serve the Federal cause in the American Civil War on August 17, 1861 in Clinton County, Illinois. His rank was Private, serving in the 30th Regiment Illinois US Infantry, Company H. His muster in date was August 29, 1861 at Camp Butler, Illinois. On January 24, 1864, in Vicksburg, Mississippi, Benjamin M. Gibson reenlisted as a veteran, to serve the Federal side in the 30th Illinois US Infantry, Company H. He was mustered out of service by Lieutenant Noyes in Louisville, Kentucky on July 17, 1865. Shortly after the conclusion of the American Civil War, Benjamin M. Gibson married Martha Alice Davis of Jefferson County, Illinois, born June 23, 1850. The couple were married November 14, 1866 in Clinton County, Illinois. According to the 1880 United States Federal Census, the Gibson family established a homestead in Beaver Creek, Hamilton County, Illinois before embarking on their journey to Texas. The Texas Census, 1820-1890 documents the Gibson family, including six children, living in Justice Precinct 2, Parker County, Texas. The 1890 Veterans Schedule, enumerating Federal veterans and their widows in Parker County, records that Benjamin M. Gibson served the Federal side during the American Civil War for 3 years, 11 months, and 22 days. The 1900 United States Federal Census lists the Gibson family with one additional child living in Justice Precinct 1, the Wright Community, Weatherford, Texas. The United States Federal Census of 1910 and 1920 documents the Gibson family living in Justice Precinct 2, Parker County, Texas. Mr. Benjamin Mitchell Gibson, American Civil War veteran and pioneer farmer died May 28, 1921 in Springtown, Texas. His wife, Martha Alice (Davis) Gibson predeceased her husband and passed away on December 31, 1909 in Springtown, Texas. 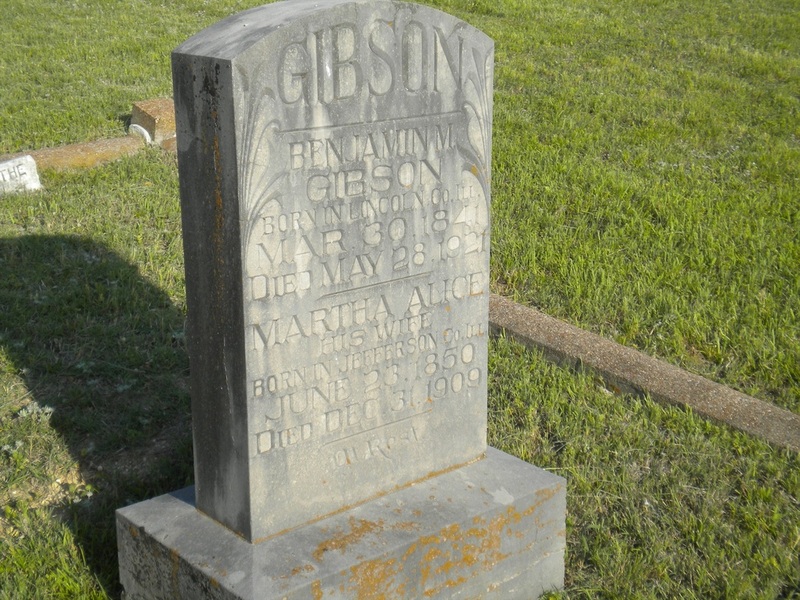 Benjamin M. Gibson is buried beside his wife, Martha Alice (Davis) Gibson in the family plot at Clark Cemetery. The Gibson’s youngest son Milton Perkins Gibson (1893-1969) and his wife Clara Mae (Green) Gibson are also buried in the Gibson family plot at Clark Cemetery.